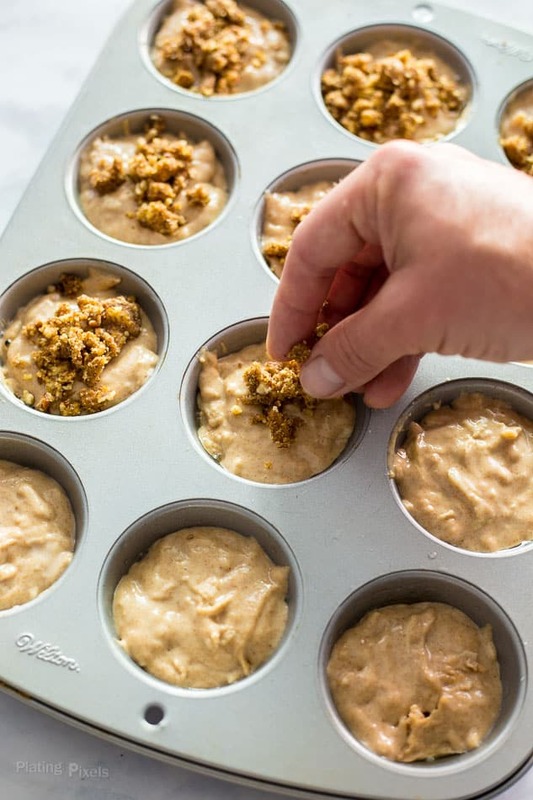 These Apple Streusel Muffins are a great way to welcome fall with seasonal baking. Moist muffins that include whole-wheat flour, brown sugar, apple, sour cream, creamer, and a streusel topping. If the majority of seasonal recipes filling up my feeds wasn’t enough of an indication, the recent first day of fall makes it official. While I miss summer, I’m just as excited about fall this year. A couple of recent heat waves of over 100° weekends makes the cooler days even more welcome. Along with crisp air, autumn colored leaves and shorter days, comes seasonal fall recipes and baked goods. 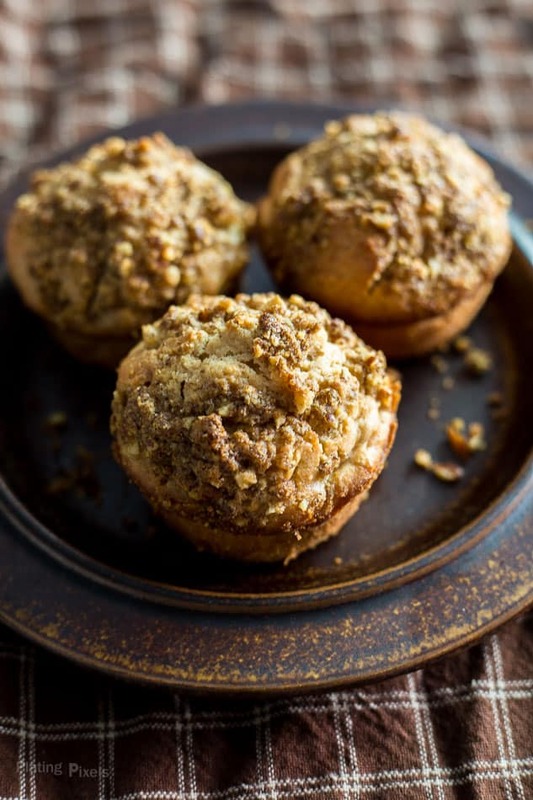 Recipes like this Apple Streusel Muffins are just what I hand in mind. Fall ingredients like apples, pears, figs, and pumpkin, as well as spices like cinnamon, clove and nutmeg will be included in many upcoming recipes. Apple Streusel Muffins have a few of these and are a unique way to enjoy your fall mornings with a cup of coffee. I consider muffins more of a decadent breakfast treat than an everyday staple. These have substituted ingredients so you can enjoy them even more. This decadent muffin includes whole wheat flour, egg, fresh apples, and flax seeds. I’ve also used sour cream and olive oil instead of vegetable oil. 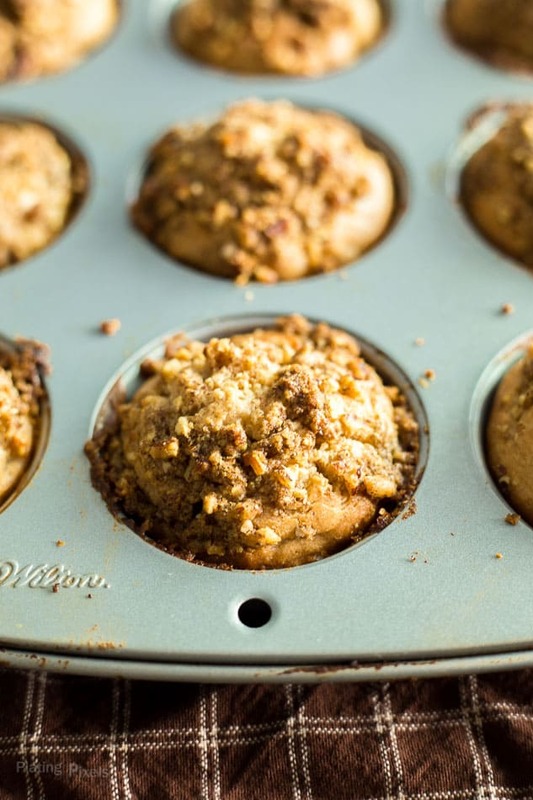 The entire batch of muffins only includes a ⅓ cup of brown sugar—another fall favorite. To go with your coffee pairing, and to add some additional unique sweetness, it also includes coffee creamer. 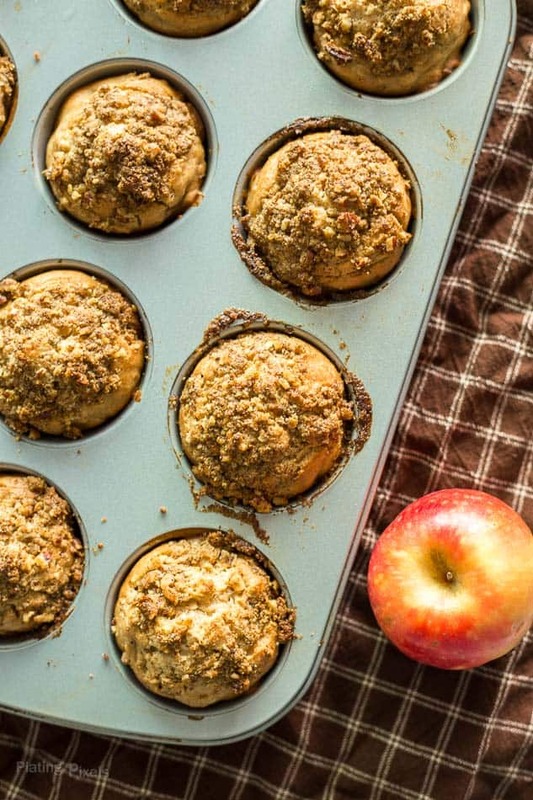 With seasonal fall ingredients, these Apple Streusel Muffins are quick and easy to make. Enjoy them as a weekend treat or anytime paired with a cup of coffee. The moist, fluffy and perfectly sweet muffins, with apples and spice, are a welcome part of fall season. Moist apple muffins that include whole-wheat flour, brown sugar, apple, sour cream, creamer, and a streusel topping. Preheat oven to 375° F. Lightly grease a twelve, 2 ½-inch muffin pan; set aside. In a large bowl stir together flours, brown sugar, baking powder, clove, cinnamon and salt. Make a well in center of mixture and set aside. In a medium bowl whisk together eggs, creamer, sour cream and olive oil until combined. Pour into dry mixture and stir just until moist. Batter should be thick, but slightly runny. Fold in shredded apples. Spoon batter into prepared muffin pan, filling each about ¾ full. In a small bowl combine pecans, flax seed, and brown sugar. Use a pastry knife or your fingers to cut in butter, until mixture is combined and has coarse crumbs. Sprinkle crumbs onto the center of batter in each cup. Bake 18-20 minutes, or until edges are golden brown and a toothpick inserted in center comes out clean. Cool on a wire rack 5-10 minutes, run a knife along edges to remove. Serve warm paired with coffee. Recipe adapted from Better Homes and Gardens: Fall Baking. 2014. Print. The muffins sound absolutely delicious! And I didn’t know that DD made any food products, the creamer sounds good. It totally is! Thanks Diana. These look so yummy, like an apple crumble wrapped in in a cake ! Perfect with a caramel coffee as you say. It kinda is Lizzie, but still appropriate for breakfast. Thanks! Okay I can’t get enough of this idea. These look incredible and perfect for a fall morning! Can’t wait to give them a try! Thanks so much Katie! I’m excited for fall too!